Initially beginning her research under Sri Kavalam Narayana Panikker, one of the most illustrious authorities on theater in the country, Bharati has been researching in Mohiniyattam for over two decades which eventually became the cause of her life. She has played a significant role in the reconstruction of the dance form, reorienting & revitalizing the concert format, & expanding the parameters of its technique & idiom. Until then, the repertoire of Mohiniyattam remained limited & repetitive. Bharati's pursuit of Mohiniyattam also initiated her into other regional art forms of Kerala, thus enabling her to imbibe the aesthetics of Mohiniyattam not in isolation but in significant relation to the interdisciplinary traditions of Kerala, be it theater, music, sculpture, painting, architecture or literature. Bharati traveled extensively in Kerala thus imbibing the regional ethos & studying the DESI traditions of Kerala, interacting with several regional art forms & their characteristics. She embarked on a process of assimilating & grafting elements from various art forms in which she discerned an affinity with LASYA, the feminine spirit which constitutes the quintessence of Mohiniyattam. Bharati's research into the cultural legacy of Kerala culminated in the publication of her book 'The Art Of Mohiniyattam', making it one of the most illuminating works on the form & spirit of Mohiyattam. She has done extensive work on the GEETHGOVIND tradition in Kerala temples. Ashtapadis as it is known, have been sung in the temples of Kerala from the 14th century & Bharati being an accomplished singer herself has traveled to several temples in Kerala & documented the unique musical tradition known as SOPANA. She was the first dancer to have incorporated the GeethGovind ashtapadis in the Sopana tradition into the Mohiniyattam repertoire. And today, the GeethGovind has become an important item in the Mohiniyattam syllabus thanks to her efforts. Bharati has added a new dimension to Mohiniyattam by successfully presenting innovative group choreographic productions. She has established the CENTRE FOR MOHINIYATTAM, which is exclusively devoted to the training & propagation of Mohiniyattam. 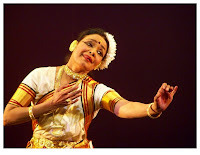 She is solely responsible for establishing Mohiniyattam on the national & international map. Besides having performed extensively both within the country & abroad, she has also produced documentaries on Mohiniyattam for Doordarshan & Films Division. Without deviating from tradition, she has single handedly established Mohiniyattam with all other classical dance forms of India. She has been conferred one of India's highest honour - the title of 'PADMASHRI' - for her tireless efforts, devotion & comittment to the cause of Mohiniyattam. For her invaluable contribution to the art of Mohiniyattam, the title of 'LASYA LAKSHMI' was conferred on her by the Kunchan Nambiar Memorial Trust, Kerala. She was honoured with the Sahitya Kala Parishad Samman by the Delhi administration & the prestigious title 'NRITYA CHOODAMANI' conferred on her by the Sri Krishna Gana Sabha, Chennai. She was also felicitated at the Theatre De La Ville, France, by the Mayor of Paris for her one woman crusade in popularizing Mohiniyattam ensuring it's place on the world map. She is also the recipient of the Central Sangeet Natak Akademi Award for her contribution to Mohiniyattam.